Jaken platform trucks with fold-down handle: versatile for easy storage. 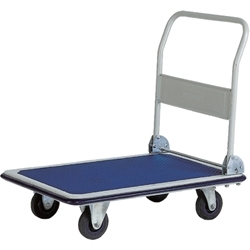 Ideal for transporting boxes and light equipment around office or warehouse. Plastic bumpers protect walls, furniture, and doorways. Call now to order today! 801-328-8788 in Utah or 1-800-326-4403 in the U.S.